The developmental test flights of the space shuttle concluded with Columbia's STS-4 mission. Commander Ken Mattingly and pilot Henry Hartsfield spent a week in space examining orbiter systems and running science experiments. The 1982 flight ended on the Fourth of July with President Reagan at the landing site to witness Columbia's return and the new orbiter Challenger leaving for Kennedy Space Center. Watch this STS-4 post-flight crew presentation film. Columbia's STS-3 mission is best remembered in the history books for its conclusion -- the first and so far only landing at the picturesque Northrup Strip at White Sands, New Mexico. In this post-flight presentation film, the crew describes the highlights of the March 1982 mission and shows some of the fun they had in orbit. The commander also tells how he accidentally "popped a wheelie" before bringing the nose gear down to the runway surface. Seven months after the successful maiden voyage of space shuttle Columbia, astronauts Joe Engle and Richard Truly took the orbiter back into space on mission STS-2. The November 12, 1981 launch demonstrated that the space shuttle was the world's first reusable manned spacecraft. Although their mission would be cut short, Engle and Truly performed the first tests of the shuttle's Canadian-made robotic arm. The crew tells the story of the mission in this post-flight presentation. The space shuttle era was born on April 12, 1981 when astronauts John Young and Bob Crippen rode Columbia into Earth orbit from Kennedy Space Center's launch pad 39A. The two-day flight proved the shuttle could get into space as a rocket and return safely with a runway landing. Following the voyage of STS-1, the two astronauts narrated this film of the mission highlights and told some of their personal thoughts on the flight. NASA Administrator Mike Griffin, along with his science, spaceflight, exploration and aeronautics chiefs, hold this news conference in Washington on February 6 to discuss the agency's proposed budget for Fiscal Year 2007. The budget would give NASA a slight increase in funding over 2006, but it features cuts in some projects to pay for funding shortfalls in the shuttle program. The Expedition 12 crew tosses overboard an old Russian spacesuit loaded with ham radio gear during a spacewalk outside the International Space Station. The eery view of the lifeless suit tumbling into the darkness of space was captured by station cameras. With a booming burst of fire and smoke, a Sea Launch Zenit 3SL rocket began its journey toward orbit from the tranquil Pacific Ocean today on a mission to deploy a communications satellite that will become part of DISH Network's space-based broadcasting system. Launch of the 200-foot Zenit 3SL rocket occurred on time at 2335 GMT (6:35 p.m. EST) from the Odyssey launch platform - a retrofitted Norwegian oil-drilling platform. Odyssey was positioned in the central Pacific along the Equator at 154 degrees West longitude, a perfect locale to take advantage of Earth's increased rotation speed at lower latitudes. The liftoff had been postponed for a week after two separate issues plagued the launch team during earlier attempts. First, a hold was called in the final minutes of the countdown last Wednesday because of an undisclosed problem with a ground support system. 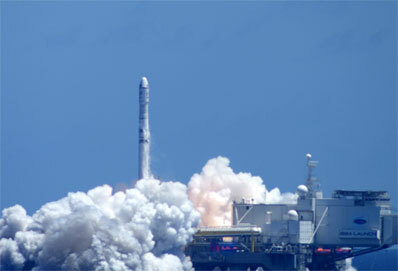 Strong ocean currents further delayed the launch from the weekend. The rocket had to be lowered from its launch mount twice during the scrubs. On its 19th flight, the modified version of Ukraine's Zenit rocket worked flawlessly. The first two stages of the launcher fired as planned to propel the Block DM upper stage and EchoStar 10 payload into a suborbital trajectory. The Block DM then assumed control of the mission to first put itself into a low parking orbit, then to finish the task of deploying EchoStar 10 in its planned elliptical orbit. It took just over one hour to successfully complete the job of placing the EchoStar 10 spacecraft into its targeted geosynchronous transfer orbit. More than a half-hour later, Earth-bound controllers heard the first signals from the 9,553-pound satellite to confirm the high-powered broadcasting platform was in good health following its fiery launch. EchoStar 10 was delivered into an orbit with a high point of around 22,207 miles, about seven miles higher that the pre-launch predictions, a low point right on the planned mark of 1,047 miles, and an inclination of zero degrees to the Equator. The craft will use on-board thrusters in five burns to gradually nudge its path around the planet higher until it is circularized at an altitude of 22,300 miles within about seven to ten days. There, EchoStar 10 will maneuver to a testing location where engineers will put the craft's systems through a series of tests for up to four weeks. After a successful completion of this checkout period, EchoStar 10 will park itself above the Equator at 110 degrees West, where it will appear to hover above a fixed area in the eastern Pacific Ocean. At that geosynchronous slot, the satellite will be co-located with EchoStar 6 and EchoStar 8. Expectations are that EchoStar 10 will be deemed operational by late April, said EchoStar vice president of satellite programs Rohan Zaveri. Built by Lockheed Martin, EchoStar 10 carries a Ku-band communications payload tailored for direct-to-home broadcasting needs. The new satellite's capability will add to EchoStar's existing lineup of core television channel offerings on the company's DISH Network system that currently has a roster of over 12 million customers across the United States. "I would tell our customers to look for good things," Zaveri said in a post-launch TV interview. "It was a great day and a spectacular launch." DISH Network provides hundreds of audio and video channels - ranging from national cable networks to local television affiliates - directly to homes, offices and schools nationwide. EchoStar 10 will work with its nine counterparts in space to help expand those programming choices over its planned 15-year service life. 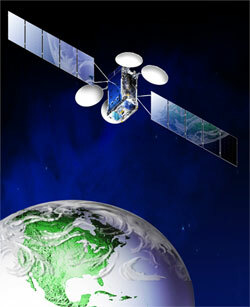 EchoStar 10 will specifically work to provide programming to individual markets across the United States. The spacecraft features 10 uplink spot beams that will be pointed at six locations inside the continental United States and four additional sites in Alaska, Hawaii, Puerto Rico, and Cuba. The satellite's 49 downlink spot beams will be pointed at over four dozen locations inside the United States, Puerto Rico, and Cuba, according to filings with the Federal Communications Commission. "This is our second mission with EchoStar and we are very happy to have achieved another mission success for DISH Network with EchoStar 10," said Sea Launch president and general manager Jim Maser. "We want to congratulate EchoStar in their 25th anniversary year and their 10th year of DISH Network, providing outstanding satellite TV service to households across the United States." "We are pleased with the success of the launch mission and want to thank Sea Launch and Lockheed Martin for their efforts for launching our satellite," Zaveri said in post-launch remarks. "We look forward to testing and use of the satellite within the next few months." 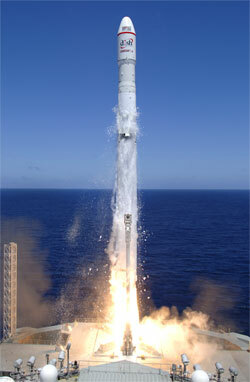 Wednesday's launch was the first of 2006 for Sea Launch - an international launch services provider formed in 1995 by Boeing, RSC Energia, the Ukrainian rocket-builders Yuzhnoye and Yuzhmash, and Norwegian ship-builder Kvaerner. Five more missions are planned for this year, Sea Launch says. "Like our colleagues in the launch industry, we are excited at the prospect of a promising upturn in the launch services market," Maser said. Sea Launch flew four times last year, and added nine new commercial contracts to its ever-growing backlog.